Purpose Atrial fibrillation is the most common arrhythmia. Its management aims to reduce symptoms and to prevent complications through rate and rhythm control, management of concomitant cardiac diseases and prevention of related complications, mainly stroke. The main objective of Effectiveness, Safety and Costs in Atrial Fibrillation (ESC-FA) study is to analyse the drugs used for the management of the disease in real-use conditions, particularly the antithrombotic agents for stroke prevention. The aim of this work is to present the study protocol of phase I of the ESC-FA study and the baseline characteristics of newly diagnosed patients with atrial fibrillation in Catalonia, Spain. Participants The data source is System for the Improvement of Research in Primary Care (SIDIAP) database. The population included are all patients with non-valvular atrial fibrillation diagnosis registered in the electronic health records during 2007–2012. Findings to date A total of 22 585 patients with non-valvular atrial fibrillation were included in the baseline description. Their mean age was 72.8 years and 51.6% were men. The most commonly prescribed antithrombotics were vitamin K antagonists (40.1% of patients) and platelet aggregation inhibitors (32.9%); 25.3% had not been prescribed antithrombotic treatment. Age, gender, comorbidities and co-medication at baseline were similar to those reported for previous studies. Future plans The next phase in the ESC-FA study will involve assessing the effectiveness and safety of antithrombotic treatments, analysing stroke events and bleeding episodes’ rates in our patients (rest of phase I), describing the current management of the disease and its costs in our setting, and assessing how the introduction of new oral anticoagulants changes the stroke prevention in non-valvular atrial fibrillation. The limitations inherent in these studies are the collection of non-randomised data or missing information. Regarding the possible infraregister of atrial fibrillation diagnosis, we have confirmed that prevalence in our setting is comparable to the prevalence reported in the available literature. Given the inconsistencies found in the pharmacy invoice registers, we had to exclude a high number of patients. We were not sure about the validity of these data and that is why they were excluded. Therefore, we can confirm that the information on drugs in this work is completely reliable. Regarding the strengths of this study, it is necessary to emphasise the large number of patients included, and the coverage of our database and the representativeness of the general population (System for the Improvement of Research in Primary Care (SIDIAP) information comes from electronic health records of 5.8 million people—more than 80% of the Catalan population), complete socio-demographic data and real clinical practice data. Moreover, this is the first population study in our setting which assesses the number of patients treated with the different pharmacological options traditionally used for stroke prevention in atrial fibrillation in a real clinical practice scenario; subsequently the study analyses the effectiveness and safety of these treatments in terms of stroke and haemorrhage rates. Management of patients with AF aims to reduce symptoms by means of rate and rhythm control, and the management of concomitant cardiac diseases to prevent AF complications such as stroke and thromboembolism.4 Antithrombotic drugs used for stroke prevention in non-valvular AF are oral anticoagulants (OAC), specifically vitamin K antagonists (VKA), and antiplatelet agents.4 Recently, new OAC have received marketing authorisation in the European Union for stroke prevention: dabigatran received authorisation in Spain in October 2011, rivaroxaban in June 2012 and apixaban in August 2013. Net clinical benefit of antithrombotic prophylaxis in patients with AF has been demonstrated in some studies.12 ,13 However, studies on OAC conducted in our setting indicate underuse3 ,5 ,14–17 that is possibly due to the VKA risk for bleeding; significant interactions with other drugs, food and alcohol; need for frequent INR monitoring and the high interindividual and intraindividual variability in INR.1 ,4 In fact, the current number of patients with AF under antithrombotic treatment in our setting is unknown. Also, no data on the adequacy of prescriptions based on stroke and bleeding risk exist. Similarly, no studies on antithrombotic effectiveness in stroke prevention in our setting have been published. Therefore, the ageing population, which increases AF and stroke incidences2 ,3; the recent approval of new OAC for stroke prevention in non-valvular AF; and the need to assess use of OAC and their clinical results through population studies of the VKA most used in our setting (acenocoumarol instead of warfarin, which has been evaluated in most clinical trials) underscore the need for the Effectiveness, Safety and Costs in Atrial Fibrillation (ESC-FA) study. The main objective of the ESC-FA study is to analyse the drugs used for the management of non-valvular AF, particularly the antithrombotic agents for stroke prevention. The study is divided into four different phases. The specific objectives of phase I are: (1) to describe the antithrombotic management of AF in our setting, (2) to assess the effectiveness of antithrombotics in real-use conditions according to stroke rates, and (3) to assess the safety of antithrombotics use according to bleeding events rates. The specific objective of phase II is to describe the management of rhythm and rate control. The specific objective of phase III is to estimate the cost of managing non-valvular AF in our setting. The specific objective of phase IV is to assess changes in effectiveness, safety and costs associated with the introduction of a new OAC. In this paper, we present the protocol of phase I of the ESC-FA study, with the description of baseline characteristics of patients with non-valvular AF and the drugs currently used for stroke and thromboembolism prevention in our setting. The ESC-FA study is a retrospective observational cohort study of ≥18-year-old individuals with a diagnosis of non-valvular AF and registered in the electronic health records throughout 2007 and 2012 in all primary care centres of the Catalan Health Institute (ICS). The ICS is the main provider of health services in Catalonia and it manages 274 primary care practices with a catchment population of 5 835 000 patients (80% of the Catalan population, or more than 10% of the Spanish population). The data source is System for the Improvement of Research in Primary Care (SIDIAP) database. SIDIAP contains anonymised clinical information that originates from different data sources:18–22 (1) eCAP (electronic health records in primary care of the ICS) which includes information since 2006 on sociodemographic characteristics, health conditions registered as International Classification of Diseases (ICD)10 codes, general practitioners’ prescriptions, clinical parameters and toxic habits; (2) laboratory data; (3) prescriptions and their corresponding pharmacy invoice data that are available since 2005, with information on all pharmaceutical products dispensed by community pharmacies for Catalan Health System prescriptions, by Anatomic Therapeutic Chemical Classification System (ATC) codes; (4) the CMBD-AH database that includes diagnoses at hospital discharge registered as ICD9 codes. Inclusion criteria: all patients older than 18 years with a new diagnosis of non-valvular AF registered in SIDIAP from 2007 to 2012. Exclusion criteria: valvular AF and antithrombotic treatment registered more than 6 months before the AF diagnosis. The cohorts were defined according to the antithrombotic treatment registered in the pharmacy invoice database at the time of diagnosis by considering an overall 6-month period for the definition of baseline date (±3 months between diagnosis date and antithrombotic treatment date). All patients with more than one dispensed package of an antithrombotic registered in this period of time were included in the study. To define dual therapy at baseline (VKA + antiplatelet, or aspirin + another antiplatelet), we considered at least two consecutive entries in the pharmacy invoice database for both drugs during the baseline period. Two consecutive entries are all those separated by a period of time equal to the period of supply of a drug package. For instance, for 1-month treatment packages, consecutive entries are those separated by a 1-month interval in the pharmacy invoice register. At baseline, the following variables were collected: gender; age at diagnosis; Mortalidad en áreas pequeñas Españolas y Desigualdades socioEconómicas y Ambientales (MEDEA) Index (deprivation index which shows the social or material disadvantage accruing to a person or group in accordance to their city/region/country, as given in the census data in Catalonia. The higher this is, the worse the deprivation23; smoking status (last register before diagnosis); alcohol intake (last register before diagnosis); body mass index (nearest value to diagnosis date, within an interval of ±2 years of diagnosis date); stroke and bleeding risk (CHADS2 and HAS-BLED were calculated at baseline with the information registered in SIDIAP; for bleeding risk, HAS-BLED was calculated without ‘L: labile INR’ item, since INR values were missing in most patients); comorbidities of interest and cardiovascular risk factors registered before AF diagnosis (cardiovascular comorbidities, previous bleedings, and kidney and liver function given as ICD10 codes specified in the ICD10 codes list; see online supplementary file); laboratory data (the nearest value to diagnosis date, within an interval of ±1 year of diagnostic date); blood pressure (BP, the nearest values of systolic and diastolic BP to diagnosis date, within an interval of ±1 year of diagnosis date); antithrombotic drugs registered in the pharmacy invoicing database within ±3 months from diagnosis date (registered as ATC codes specified in the ATC codes list; see online supplementary file); concomitant drug therapy of interest registered in the pharmacy invoice database within ±3 months from diagnosis date (rate and rhythm control drugs, other cardiovascular medication, diabetes treatments, proton pump inhibitors, and non-steroidal anti-inflammatory drugs listed as ATC codes specified in the ATC codes list; see online supplementary file); stroke and other thromboembolic events rates and bleeding episodes (cerebral, gastrointestinal, eye and other haemorrhages) rates registered at CMBD-AH before AF diagnosis in order to confirm the stroke and bleeding rates registered at SIDIAP (as ICD9 codes specified in the ICD9 codes list; see online supplementary file). During follow-up the following variables will be assessed for objectives 2 and 3: stroke and bleeding risk calculated during follow-up; stroke and other thromboembolic events and haemorrhages rates; antithrombotic drugs taken during follow-up to assess treatment changes, new treatments or end of treatment, and analysis of effectiveness and safety of the main treatment options—VKA, antiplatelet drugs and no antithrombotic treatment—through the variable ‘net clinical benefit’. Descriptive statistics were used to summarise the data. Categorical variables were expressed as frequencies (percentage) and quantitative variables as mean (SD) or median (IQR) for non-normally distributed variables. The differences between cohorts were tested using analysis of variance or Kruskal-Wallis test, χ2 or Fisher exact test for unadjusted comparison, as appropriate. Incidence rates and incidence rate ratios of stroke and bleeding events during the follow-up will be estimated using Poisson regression. The resulting person-time value will be used as an offset variable. Time-to-event analysis will be performed using non-parametric methods like Kaplan-Meier and log-rank test. Multivariate Cox proportional hazards regression models will be fitted, adjusting for baseline sociodemographic characteristics, and confounding and predictive factors of each event. Extended Cox models will be used when the model’s proportional hazards assumption does not hold. Sensitivity analysis will be carried out excluding patients who change from one cohort to another during the follow-up and censoring according to the patient's change of cohort. All statistical tests were two-tailed using a significance level of 5%. The analyses were performed using Stata V.11 (Stata Corp, Collage Station, Texas, USA) and R V.3.0.2 (R Foundation for Statistical Computing, Vienna, Austria). The present study follows national and international regulations: Declaration of Helsinki Ethical Principles for Medical Research Involving Human Subjects, and Good Research Practice principles and guidelines. Regarding the data contained in the databases and as per Spanish legislation about confidentiality and data protection (Ley Orgánica 15/1999 de 13 de diciembre de Protección de Datos de Carácter Personal), data included in SIDIAP are always anonymised and identified by an internal code, which makes it impossible to identify the individuals included. Thus, it is not necessary to ask for informed consent from the participants. Each individual is identified through an encrypted, anonymised code. For the linkage with CMBD database (or other databases), SIDIAP uses a ‘trusted third party’ in order to ensure confidentiality when linking both data sources. This third party has no access to clinical information, only to codes and IDs. There were 41 468 patients with a new AF diagnosis registered in SIDIAP between 2007 and 2012. Of the newly diagnosed patients, 25 601 (61.7%) fulfilled the inclusion criteria and none of the exclusion criteria (figure 1). Study cohorts were based on antithrombotic treatment registered at the time of AF diagnosis (±3 months interval). Two treatment groups were excluded from the baseline description of the cohorts (11.8% of patients included): patients with only 1 dispensed package of antithrombotic registered during study period (n=1755) and patients with ≥3 different antithrombotic drugs registered (n=1261), as this is a group that is excessively heterogeneous. Study flow chart. Patients included and excluded from the study. AF, atrial fibrillation; SIDIAP, System for the Improvement of Research in Primary Care; VKA, vitamin K antagonist. We present the baseline characteristics of 22 585 individuals with non-valvular AF, diagnosed from 2007 to 2012. Their mean age was 72.8 (SD 13.1) years and 51.6% were men. The number of patients diagnosed per year with AF in each cohort is shown in figure 2. Distribution of new diagnoses of atrial fibrillation (AF) per year and cohort. Percentage of patients newly diagnosed with AF per year in each cohort in the figure, number of patients in the table below. Vitamin K antagonists (VKA; n=9057); antiplatelets (n=7424); VKA + antiplatelet (n=227); dabigatran (n=153); no antithrombotic treatment (n=5724). There were 5724 (25.3%) of patients with no antithrombotic treatment registered at baseline. The most prescribed treatment were VKA (9057 patients, 40.1%), followed by platelet aggregation inhibitors (7424, 32.9%). The remaining patients were initiated on VKA + antiplatelet (1.0%) or on dabigatran (0.7%). During the study period, the proportion of patients with no antithrombotic treatment decreased from 28.2% in 2007 to 26.1% in 2012, while the proportion of VKA-treated patients increased from 37.5% in 2007 to 41.8% in 2012. A decrease in the prescription of antiplatelet agents, from 33.4% in 2007 to 27.9% in 2012, was observed. The baseline characteristics of our patients, including percentages of patients with missing data, are described in tables 1⇓⇓–4. Table 1 shows higher proportions of men in all cohorts except in the antiplatelet group. Patients treated with any antithrombotic drug were older than non-treated patients. There were more patients over 75 years in the group of antiplatelets. There were more current smokers in the group of patients with no antithrombotic treatment; however, this group had a higher percentage of missing values than the rest of the groups. There was also a high percentage of missing values in alcohol intake. Considering only the three main cohorts (no treatment, VKA, antiplatelets) and according to a CHADS2 score ≥2, 52.8% of the patients from the VKA cohort would be considered as ‘adequately anticoagulated’. According to a CHA2DS2VASc score ≥2, 62.6% of VKA patients would be ‘adequately anticoagulated’ and at least 6.1% of patients in the same group (CHA2DS2VASc=0) would be ‘inadequately anticoagulated’ as their stroke risk is low (figure 3). CHA2DS2VASc scores in the treatment cohorts. Percentage of patients from each cohort by stroke risk according to CHA2DS2VASc score. VKA, vitamin K antagonist. On the other hand, there are 38.8% patients in the no-treatment group with a CHADS2 score ≥2; so they should be receiving VKA. This percentage is 65.5% if we take into account the CHA2DS2VASc score (≥2); thus, only 34.5% patients with a low-moderate stroke risk are not treated with antithrombotics. Patients treated with antiplatelets and VKA + antiplatelets have higher scores in the HAS-BLED bleeding classification. Table 2 shows that patients with antithrombotic treatment had more cardiovascular comorbidities when compared with non-treated patients, and patients in the dual therapy VKA + antiplatelet cohort had more comorbidity. Hypertension was the most frequent comorbidity, followed by dyslipidaemia. Coronary artery disease was found in 34.8% of the patients in the VKA + antiplatelet cohort, with a high frequency of previous myocardial infarction. Non-treated individuals had better estimated glomerular filtration rate (eGFR) than patients initiated on antithrombotic therapy, except for dabigatran (84.4% of dabigatran patients had eGFR >60 mL/min/1.73 m2). However, there were more missing values in that group. Disease control parameters and laboratory data of interest are described in table 3. Around two-thirds of patients had good control of BP, glycated haemoglobin and low-density lipoprotein cholesterol levels without differences between cohorts. We describe medications of interest in use at baseline in table 4. Patients with antithrombotic prescribed at baseline received more co-medication than non-treated patients, since they had more comorbidity. Antihypertensive drugs, statins and proton pump inhibitors were the most frequent co-medications. All baseline sociodemographic characteristics and comorbidities were significantly different among the five groups. The ESC-FA study was designed as a retrospective observational cohort study on the effectiveness and safety of antithrombotic therapy in patients with non-valvular AF that was in use under clinical conditions in Catalonia. In this article, we report the baseline sociodemographic and clinical characteristics of 22 585 patients with non-valvular AF recently diagnosed, and discuss the main differences between non-treatment and usual treatments for prevention of stroke and thromboembolic events. The patients included in the study have been divided into five cohorts according to the antithrombotic treatment prescribed at the time of diagnosis. This is an observational study performed with data obtained from an electronic database. Therefore, it is subject to certain limitations inherent in all such studies, such as the collection of non-randomised data, missing or incomplete information, and possible confounders. The strengths of our study are the large number of patients included, representativeness of the general population (SIDIAP information comes from ICS, which manages more than 80% of the Catalan population), complete sociodemographic and health records, and real clinical practice data. The diagnosis is sometimes registered in the patients’ electronic health records after the real diagnosis has been made, and the start of antithrombotic treatment is registered before or after the diagnosis register. To overcome this inconsistency, the cohorts have been constructed taking into account antithrombotic treatments registered during the interval of ±3 months from the diagnostic date. Regarding the pharmacy invoicing register, we have excluded 11.8% of the 25 601 patients with non-valvular AF due to inconsistencies in the register of treatments. We decided to exclude 1261 patients as they had registers of three or more different antithrombotic drugs simultaneously at baseline and we assumed there might be errors in the pharmacy invoice database. We decided to exclude another 1755 patients from the baseline description of the cohort because they only had one package of antithrombotic medication dispensed and there were dispensing errors. Although most patients are treated with VKA, INR data are not described at baseline because two different methods of INR determination are used in Catalonia: by laboratory standard determination, which is performed in a low proportion of patients; or through a point-of-care rapid INR determination carried out during primary care visits or in hospitals in most cases. Since we do not have access to hospital records, a high number of INR had missing values. Therefore, INR has not been included in the HAS-BLED calculation. However, at this stage it should not make a significant difference, since INR is only determined in VKA-treated patients during follow-up and we present the data at baseline, when the INR has not yet been determined and the ‘L’ for HAS-BLED is 0, the same as in patients not treated with VKA. Nonetheless, we will conduct a validation for the INR during the follow-up period as it is an essential parameter in the clinical management of VKA-treated patients. The number of patients included in the VKA + antiplatelet cohort is low, possibly due to the short interval of time used to consider a situation of dual therapy (two consecutive registers of both drugs at baseline). The number of patients included in the dabigatran cohort is also low, since this drug was authorised for non-valvular AF in Spain at the end of 2011 and we only include data up to 2012. Moreover, dabigatran is subject to restricted conditions for its prescription in our setting. Data for rivaroxaban are not shown, since there were only a few registers during 2012. Data for apixaban are not shown either, as it was authorised in Spain for non-valvular AF in 2013. VKA prescription rate in patients with non-valvular AF at baseline is similar to those in other studies. Kirchhof et al29 conducted an observational study (PREvention oF thromboemolic events—European Registry in Atrial Fibrillation, PREFER-AF) including 7243 patients in seven European countries between January 2012 and January 2013. In the cross-sectional description, their results suggest much better adherence to evidence and recommendations than previous reports of similar registries: VKA were prescribed in 66.3% of the patients included, antiplatelets in 11.2%, VKA + antiplatelet dual therapy in 10.9%, and dabigatran in 6.1%. They reported 17.7% of non-treated individuals. Results from a prospective follow-up study have not been published as yet. Kakkar et al30 conducted the GARFIELD study in different primary care settings, which described VKA prescription in 45.2% of patients with AF, antiplatelet agents in 25.3%, dual therapy VKA + antiplatelet in 10.6% and dabigatran in 4.5%. They included 10 614 patients enrolled throughout 2009 and 2011. This study reported similar VKA and antiplatelet prescription rates to those found in our setting. 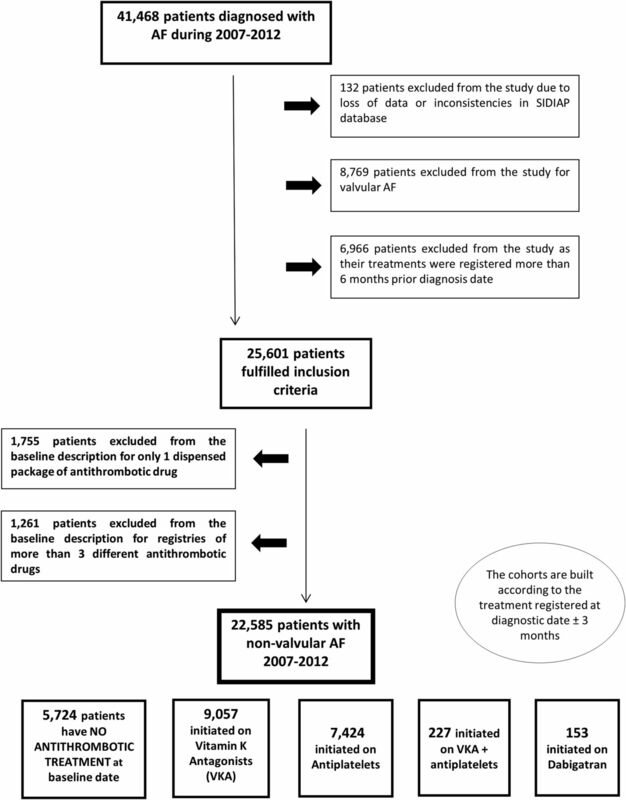 Scowcroft et al31 conducted a cohort study of 81 381 patients with AF from the General Practice Research Database, diagnosed with AF between 2000 and 2009. They found differences in VKA prescription according to the age group: in the 60–69 years age group, VKA was prescribed to 57% of the patients; in the 70–79 years age group, 55% of patients were receiving VKA; and only 32% of patients older than 80 years were treated with VKA. Although this study was carried out with data from an electronic database, which makes possible the analysis of a large set of patients, the results are not easily comparable to ours since we have not stratified patients by age group. In our study, 51.1% of the VKA group are over 75 years of age. 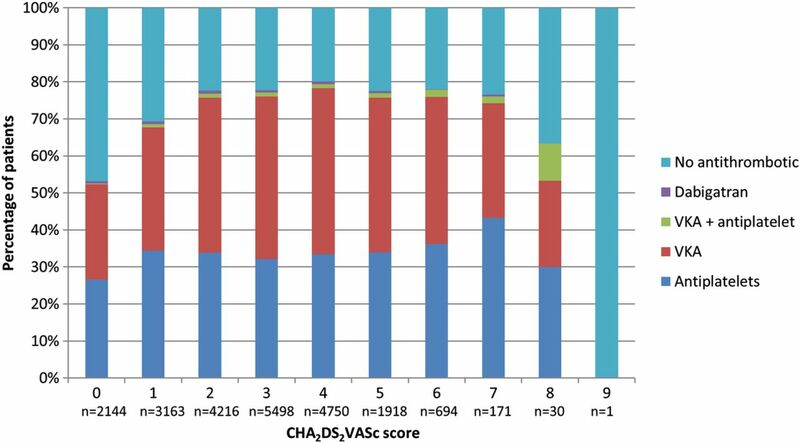 Kakkar et al30 and Barrios et al28 describe 61.9% and 57% of patients adequately anticoagulated, respectively, by considering CHADS2 score. On the other hand, Scowcroft et al31 included 90% of patients with a CHA2DS2-VASc score ≥2, but only 45.6% of the patients included received warfarin. Although it is difficult to compare our study with prior reports, even if the prescription of OAC in our setting appears to be low, it is nonetheless similar to other studies. We describe the actual use of antithrombotic agents for stroke and thromboembolism prevention in a large number of patients with non-valvular AF in Catalonia. Age, gender and comorbidity in patients with non-valvular AF were similar to those reported in previous studies. The prescription rates of patients initiated on VKA and on platelet aggregation inhibitors were similar to those reported in other studies. We cannot establish any conclusion about dabigatran use, since only 153 patients had been initiated on this new OAC as its approval for use in patients with AF took place in latter 2011. This is expected to change during follow-up, when more patients will have been included in the dabigatran cohort and will have started treatment with rivaroxaban and apixaban as well. The next step in ESC-FA study is to assess effectiveness and safety of antithrombotic treatments by analysing stroke and other thromboembolic events, and haemorrhage rates in our patients. These data would show changes in the management of patients with non-valvular AF in Catalonia due to modifications in antithrombotic treatment during follow-up and the introduction of the new OAC. The authors thank Edurne Zabaleta-del-Olmo for her support and advice in scientific writing, and Eulàlia Farré Maduell for the English review and edition. De Caterina R, et al. NICE. NI for H& CE. Atrial fibrillation: the management of atrial fibrillation. 2014.
. Construction and validation of a scoring system for the selection of high-quality data in a Spanish population primary care database (SIDIAP). Inform Prim Care 2011;19:135–45. Contributors RM, DC, XC were involved in study design. MG-S, CVU, RM were involved in writing and editing the manuscript. JMªE was involved in data extraction from SIDIAP. AR-L was involved in statistical analysis. MG-S, CVU, RM, DC, XC, IF-G, ATM, ED, MC, BB, CV were involved in review and final approval of the manuscript. This article is part of the article compendium for the PhD thesis of MG-S.
Funding ESC-FA study, study in various phases on the effectiveness, safety and cost of thromboembolic prevention in patients with non-valvular AF received funding from the Ministry of Health, Social Policy and Equality (Spanish Government) through the 2011 Grants for Independent Clinical Research (reference EC11-251). Ethics approval The IDIAP Jordi Gol Clinical Research Ethics Committee, the reference institution for research in primary care of the ICS, approved the study protocol. Data sharing statement Statistical code and data set available from the corresponding author.